SINGAPORE’S first standalone natural history museum now officially has a chief, who will lead the museum under a new academic unit of the National University of Singapore (NUS). 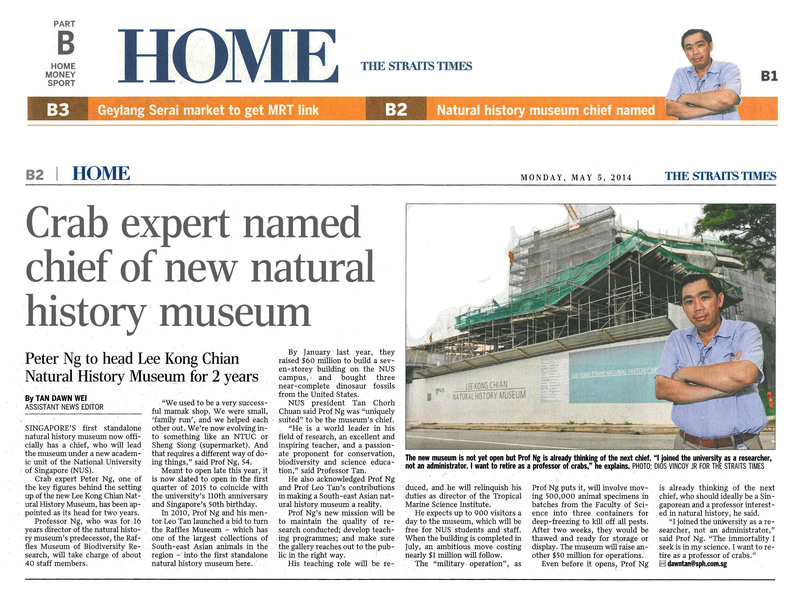 Crab expert Peter Ng, one of the key figures behind the setting up of the new Lee Kong Chian Natural History Museum, has been appointed as its head for two years. Professor Ng, who was for 16 years director of the natural history museum’s predecessor, the Raffles Museum of Biodiversity Research, will take charge of about 40 staff members. “We used to be a very successful mamak shop. We were small, ‘family run’, and we helped each other out. We’re now evolving into something like an NTUC or Sheng Siong (supermarket). And that requires a different way of doing things,” said Prof Ng, 54. Meant to open late this year, it is now slated to open in the first quarter of 2015 to coincide with the university’s 110th anniversary and Singapore’s 50th birthday. In 2010, Prof Ng and his mentor Leo Tan launched a bid to turn the Raffles Museum – which has one of the largest collections of South-east Asian animals in the region – into the first standalone natural history museum here. By January last year, they raised $60 million to build a seven-storey building on the NUS campus, and bought three near-complete dinosaur fossils from the United States. NUS president Tan Chorh Chuan said Prof Ng was “uniquely suited” to be the museum’s chief. “He is a world leader in his field of research, an excellent and inspiring teacher, and a passionate proponent for conservation, biodiversity and science education,” said Professor Tan. He also acknowledged Prof Ng and Prof Leo Tan’s contributions in making a South-east Asian natural history museum a reality. Prof Ng’s new mission will be to maintain the quality of research conducted; develop teaching programmes; and make sure the gallery reaches out to the public in the right way. His teaching role will be reduced, and he will relinquish his duties as director of the Tropical Marine Science Institute. He expects up to 900 visitors a day to the museum, which will be free for NUS students and staff. When the building is completed in July, an ambitious move costing nearly $1 million will follow. The “military operation”, as Prof Ng puts it, will involve moving 500,000 animal specimens in batches from the Faculty of Science into three containers for deep-freezing to kill off all pests. After two weeks, they would be thawed and ready for storage or display. The museum will raise another $50 million for operations. Even before it opens, Prof Ng is already thinking of the next chief, who should ideally be a Singaporean and a professor interested in natural history, he said.